Surgery is scheduled for Monday Sept. 14th. Dr. Devinsky and Dr. Weiner presented Gabby’s case at neuroconference where 22 doctors unanimously agreed that Gabby is a surgical candidate. They feel the EEG data, presentation of seizures, and questionable area on the MRI give a compelling reason to go back in and make a final attempt to stop these seizures. Dr. Weiner plans to remove any remaining tissue on the right side effectively turning her functional hemispherectomy into a complete anatomical hemispherectomy. Dr. Weiner will also inspect the questionable area on the MRI for any further connection as well as reassessing all other areas of disconnection. This surgery should not leave Gabby with any further deficits. There is always the risk of nerve damage, stroke, hydrocephalus, and death but it is our prayer that she will come through this without any complications. This surgery will be one stage and should involve a 4-5 day hospital stay. We are in the process of figuring out the logistics of getting Gabrielle to NYC for pre-op testing and then back again in a few weeks for surgery. At this point we are thinking Duff may stay here with the other children while I fly up to NY with Gabby for testing and surgery. Gabrielle has felt pretty good over the last week since her discharge home. The doctors increased her dosage of Klonopin at night which really helped reduce the number of seizures we were seeing. She was even able to go to her friend Katie’s Abby Cadabby birthday party. 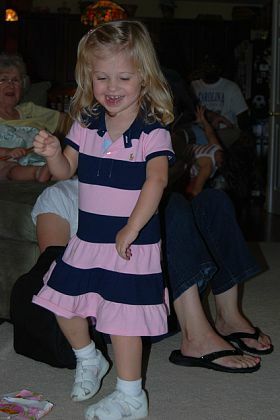 I included the picture above from the party which shows Gabby dancing to her favorite song “Big House”. Thanks Julia! It was just precious to watch Gabby go through her gift bag on the way home. She excitedly pulled one item out of the bag at a time, had me identify it, smiled with glee, and then carefully set it aside so she could reach in for the next goody. Unfortunately Klonopin is a medication that you quickly gain tolerance to and we are already beginning to see more seizures again. Gabby began clustering yesterday morning and I administered diastat to stop the onslaught. So far this morning she seems good. We are just taking one day at a time…..
I’ll update as we know more. Your family continues to remain in our prayers. We are all too familiar with the stress of three brain surgeries. We are here if there is anything you need. We hope to only hear good things from here on out and that you will return home from NY with a completely seizure free little girl. She is so beautiful and her pictures show how she is so full of life. What a blessing she is and a story she will tell. Allen, Jack and I pray for Gabby each day. God has placed such gifts on Gabby – a smile that lights up a room, strength and stamina which surpasses others by leaps & bounds and the ability to show people the love of Jesus – AWESOME! We lift you all up and pray strength, safety and joy for the days ahead. Remember, God loves you and so do we! Wow…Gabby sure is a cutie!!! I will be thinking about you all in the weeks to come. That is the type of surgery that Madeleine had an anatomical hemispherectomy. I know that this is very hard but if this is true the seizures are comming from the disconnected side and they remove that to make sure there is no connections I think this will be the end of her seizures for good! Madeleine has remained seizure free since the day of her surgery it has been 1year &5 months!!! I just hate she has to go through another surgery. She is a dollbaby! Keeping her in my prayers! God Bless!! Maybe we will run into each other at Raleigh Neurology one day! Just wanted to let you know that I was thinking about you and Gabby and praying for success and healing today! If you need anything, please do not hesitate to ask! Thinking of Gabby & Family today saying many prayers for her!